Offering an super-charged, mega-amped up amount of horsepower, you'd think this 1020W Power Supply from Aerocool should sound like a revved up demon from hell, right? Incredibly, this Aerocool Horsepower 1020W Power Supply allows the user to feel the intensity of their horsepower in sweet, sweet silence. Featuring an eye-catching 140mm Quad Blue LED fan, both the intensity and illumination can be controlled by the user. One of the major highlights of this power supply comes from it's modular smart cable management, a system which allows you to choose the cables that YOU want to use. 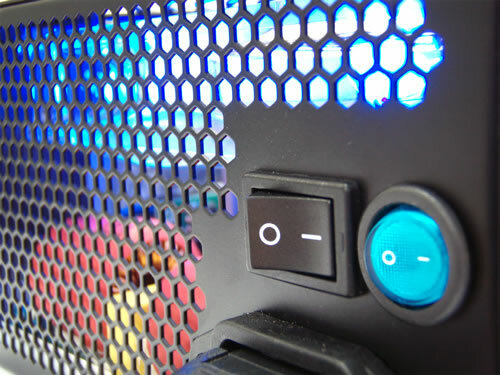 This excellent feature will seriously reduce in-case cable clutter and create much better airflow within the case. Rounding out the awesomeness of the Aerocool 1020w Power Supply are the PCI Express 2.0 connectors (including the new 8-pin connectors), as well as the ability to handle the latest in hardware, including dual core CPUs, multi-core GPUs and dual video card solutions.